LEHIGH VALLEY, PA. — Former Baltimore Orioles pitcher, Jim Palmer, was named the keynote speaker on November 26, 2014 at the 17th annual LifePath & Pennsylvania Institute of Certified Public Accountants’ (PICPA) Thanksgiving Benefit and Awards Luncheon. Palmer spoke to a crowd of over 600 at the Holiday Inn Conference Center in Fogelsville where he entertained the crowd with “Boys of Summer Stories.” All proceeds will go to LifePath’s programs and services for individuals with developmental disabilities. Source: The Morning Call. 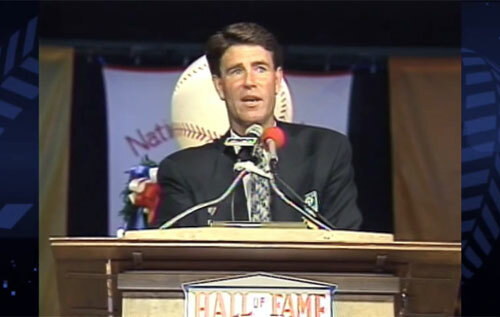 Photo shows former Orioles pitcher Jim Palmer speaking at his Baseball Hall of Fame induction 1990. Palmer toured the LifePath’s Bethlehem facility program for adults which also honors the service of several prominent community members, such as Maryann Crossfield who was presented with LifePath’s most outstanding family award and Heather Rodale who received the Lehigh Valley Community Service Award. Palmer is a retired pitcher who played his entire 19 year career in Major League Baseball with the Baltimore Orioles. He was elected to the Baseball Hall of Fame in 1990. Today Palmer is the color analyst on Orioles TV.